Vedanthankal Lake Bird Sanctuary is a 30 ha (70-acre) sanctuary located in the Kancheepuram District of the state of Tamil Nadu, India. The sanctuary is about 75 km from Chennai on National Highway 45 (NH45) south of Chengalpattu. Vedanthangal is a home for migratory birds, such as cormorants and snake birds. Ornithologists observe birds at the sanctuary. Vedanthangal is at around one and half hour journey from Chennai. 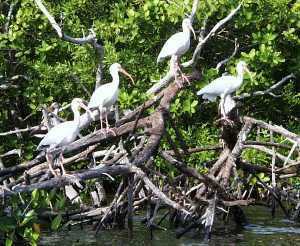 It is one of the oldest water bird sanctuaries in the country. Vedanthangal in Tamil language means 'place of the hunter'. This area was a favourite hunting spot for the local landlords 300 years ago. The region attracted a variety of birds because it was dotted with small lakes that acted as feeding grounds for the birds. Realising its ornithological importance, the British government undertook steps to develop Vedanthangal into a bird sanctuary as early as 1798. This was established in 1858 by the order of the Collector of Chingleput District. The sanctuary features thousands of birds coming from various countries, some of which can be easily identified. Some easily found bird species include Cormorants, Darter, Grebes, Large Egret, Little Egrets, Moorhen, Night Herons, Paddy Bird, Painted Stork, Pintails, Pond Heron, Sandpiper, Shovellers, Terns, White Ibis and many more. The migratory birds include Garganey Teals Canada, Snake Bird Sri Lanka, Grey Pelican Australia, Grey Heron Bangladesh, Open-billed Stork Bangladesh, Glossy Ibis Sri Lanka, Painted Stork Siberia, Spoonbill Burma and Spot Bill Duck Canada.